Pollen is not a drug but a food. People who are allergic to pollen did not have to worry because the pollen collected and processed by the bees did not cause any reaction. .
Bee pollen is the most complete food in nature. It is the only food that contains the 22 essential amino acids, 100gr of pollen proteins that contain the same 1/2 kg. of meat!. The word “pollen” from the Greek: “pale” , which in turn appointed the flours and pollen. Pollen, a warren of tiny grains, is a powder produced by the male organs of plants, in charge of fertilizing female organs. The bees collect pollen from flowers with their feet and moistened with nectar (salivary secretions, bring even more wealth-) shaping of small ball that carried to the hive to feed the bees. Through these travels from flower to flower contribute selflessly to the pollination of many species. The man gets cajoncilllos with placing a grid at the entrance to the hive. The pollen has a flavor they are not used. And though at first distasteful know we will get to like It can be taken with plain yogurt, a tablespoon of honey (or jam) and a pollen. Some quietly chewing up pollen completely undone in the mouth, there are those who help you swallow a sip of water. But if none of these forms become simple the task of taking a spoonful of pollen, can be dissolved in orange juice or milk and add a little honey is an excellent way to get it. The uses that give the bread of bees as therapeutic product provide wonderful results after the only a few days. It has all indications of pollen: anemia, circulatory disorders, brain and head injuries, stroke, gastritis, hepatitis, gastro-duodenal ulcer, allergy, flu, loss of libido and male infertility and alcoholism. This product can be absorbed through the lining of the mouth, like a bonbon. The most convenient would keep him in the mouth without swallowing, and not to drink during the next hour to not dilute. The recommended dose is 2 g / day for an adult and 0.5 g / day for children (Aiterapia, 2001). .
Once collected the daily pollen, you should dry, for which it is introduced into a dryer, which consists of a ventilated chamber inside which there are shelves where they spread pollen balls. Heat for 3 or 4 has temperature never exceeding 48 C. After this process pollen until it loses moisture by 5.6%, and with this moisture is stabilized, maintaining all its nutritional properties. When you exit the dryer has to be purified, ie they must remove all impurities, legs, antennae and so on. Producers amateur hand remove the impurities. Professionals use blowers equipped with hopper vents, blowers and appropriate screens. It comes after packing in jars flush with the edge of the container so that air can be minimal. 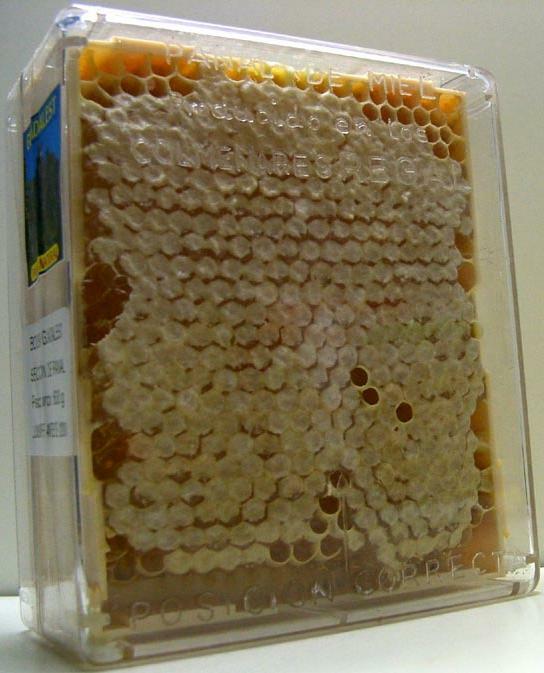 Packaged in this way the preservation of the nutritional properties of pollen is insured for a maximum period of one year at normal temperature. This is the core in processing. Is to remove excess moisture. This moisture will not allow the growth of bacteria and fungi, and possible delay in the development of mites and insects. As the moisture the most influential factor in the preservation of pollen, is fast drying and effectiveness of which depends on many ocacsiones that no substantial loss of biological activity. 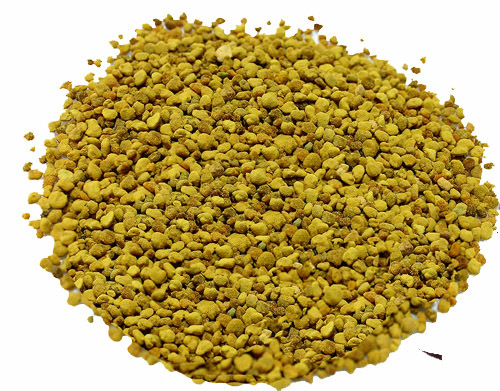 There are 2 methods for drying pollen, one natural drying and another artificial. Natural: involves the exposure of pollen to the combined action of wind and sun on trays of various dimensions with fine-mesh bottom placed at some point, either individually or on shelves. The layer of product should not be greater than one centimeter. Prior to packaging, the pollen must have a temperature less than or equal to the outside. The stored product while still retains an amount of heat and retains it during the storage period has proved difficult because moisture moves from one place to another for purposes of temperature differences, resulting in condensation on the surface of pollen. So at the end of the drying process of pollen must be cooled, ventilated, in their own trays, without extracting the dryer as humidity would capture. It is helpful that the premises must be clean and apart from the demands of infrastructure and facilities is important to handle staff is role. Once packaging can be kept 1-2 years. Without pollen seed that would not become plant or tree that bears fruit.